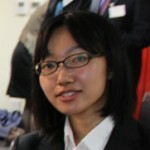 Ayaka Ogita is from Tohoku University, and spent her year abroad at the University of Hawaii at Manoa in Honolulu, Hawaii as an exchange student on the 2014 TOMODACHI Sumitomo Corporation Scholarship Program. Before leaving Japan, she was keen on working in the non-profit world, however after witnessing the amount of value the Hawaiian people placed on their local history, she now seeks to contribute to her own community and country, particularly in the Tohoku region. Ms. Ogita attended the 2014 U.S.-Japan Council Annual Conference in October 9-10, 2014 in Honolulu, Hawaii as a TOMODACHI Sumitomo Corp. Scholar. Her experience at the conference is below. 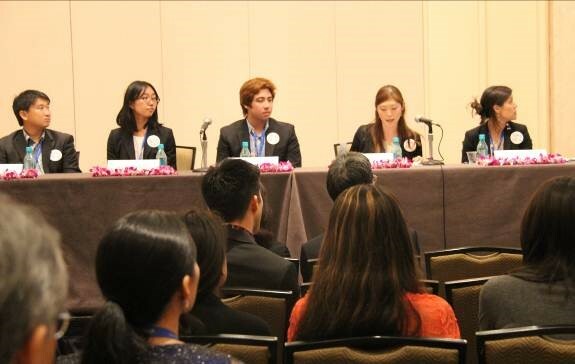 I had the honor to attend and give a speech at the 2014 USJC Annual Conference as part of the TOMODACHI Panel Discussion. Many people encouraged me that my speech touched their heart. I am currently studying about Japanese American history at University of Hawaii, so the experience of meeting many Japanese American participants was a valuable experience. In addition, meeting USJC members and other TOMODACHI alumnus piqued my interest in further engaging in U.S.-Japan bilateral relationship. I am truly grateful for being able to be a part of this conference and I hope to contribute in strengthening ties between the two countries by nurturing the network I built through this event. Why did you apply to the TOMODACHI Sumitomo Scholarship? In March 2013, I participated in a short-term study abroad program to the University of California in Riverside. Over the course of a month, I studied cultural diversity and the problems of racial discrimination in the United States. I learned about and experienced how people who have different cultural backgrounds coexist there, and realized how different it was from Japan. During the program, I had a chance to learn about Japanese Americans history and how Japanese Americans had inner conflicts related to their identity because they were American citizens, but they were also Japanese by blood. After I came back from California, I became interested in their history, identity issue, and the effect that Japanese Americans had on American society. As I studied about Japanese American experience, my interest in the connection between these two countries had been growing, so I wanted to enter the TOMODACHI community and create networks with many fascinating people so that I can widen my view of the world, as I consider how I can help in the future relationship between America and Japan. What would you like to learn from this program? On October, I had given the opportunity to attend the US-Japan council in Hawaii and meet and talk with many Japanese Americans. The TOMODACHI Sumitomo Scholars Program will give me the opportunity to visit the Sumitomo Corporation in New York next year. I expect to study about the experience of Japanese Americans there. In addition to that, I want to enhance my perspectives and knowledge of US-Japan relations through meeting with executives who are working in Sumitomo Corporation in New York and related to both America and Japan. I would also like to clarify my visions of my future career by talking with them. Besides this, I can see some cultural sights in both New York and Washington D.C. I look forward to gain a deeper understanding of culture and life in the U.S.
What connection and /or interest do you have with the United States? American culture such as music, literature, food, and movie is widespread in Japan, so I have grown up feeling American culture familiar and I like them. When I was a child, I had an image that America is a rich country and had a longing for America. However, once I studied the racial diversity in America in my university, I realized the problem of racial discrimination is remained as a big challenge. Also, there are many contradictions in society such as an increase in the gap between rich and poor and the problem of the health insurance. I am staying Hawaii now and I knew Hawaiian people are forced to compromise on a matter that American army use a lot of land in Hawaii as a military base. The independence movement from America was held in Hawaii and many people joined it. I am interested in how American government will resolve such social problems and control their effect on all over the world. I also have great interest in what we should aim to in the future US-Japan relationship and if we strengthen the US-Japan relation, what influence it has on other countries.